You can use AWS Service Catalog to create preconfigured products that your developers can launch. In an organization, it’s typical for a cross-functional center of excellence like the Cloud Center of Excellence (CCOE) to maintain the catalog for the organization. An AWS Service Catalog product can contain one or more AWS resources. Many customers use AWS Service Catalog to restrict access to resources, such as AWS APIs, using a launch constraint. Launch constraints allow an AWS Service Catalog end user to launch an AWS Service Catalog product without requiring elevated permissions to AWS resources. An AWS Service Catalog product also allows a CCOE to enforce configuration standards within a customer’s products, while granting development teams flexibility to customize AWS resources using parameters. Despite the flexibility of parameters, it is difficult for a CCOE to determine every development team’s architecture patterns and requirements. Accommodating the broad requirements of development teams leads to a large portfolio of AWS Service Catalog products that need to be maintained. Recently, we announced AWS CloudFormation support to provision AWS Service Catalog products. In this blog post, I’ll walk you through how to leverage this new feature to provide development teams the freedom to create complex architectures. The building blocks for development teams will be AWS Service Catalog products configured as simple hardened components. Using simple components will help the CCOE reduce their workload while implementing preventative controls that manage an organization’s risk. Why wouldn’t I simply use native AWS CloudFormation or native AWS Service Catalog to provision resources? For many customers, the CCOE is responsible for maintaining the AWS environment. This includes establishing security, governance, and operating controls that allow the business to leverage AWS at scale while managing risk. Typically, the CCOE owns the whitelisting process that approves the use of AWS services. The output of this process is a directive control—namely, the configuration standards and guidelines that development teams must follow when they use the AWS service. Establishing these controls takes time because the CCOE must evaluate each AWS service. Standards and guidelines are a great start, but ultimately the business needs to ensure that directive controls are followed by creating preventative, detective, and reactive controls. The most important of these controls are preventative controls. Why allow bad things to happen if we can prevent them? The easiest preventative control is simply not giving a user permission to use an AWS service. Ideally, your preventative controls are more nuanced than this because these controls can prevent the business benefits of an AWS service from being realized. 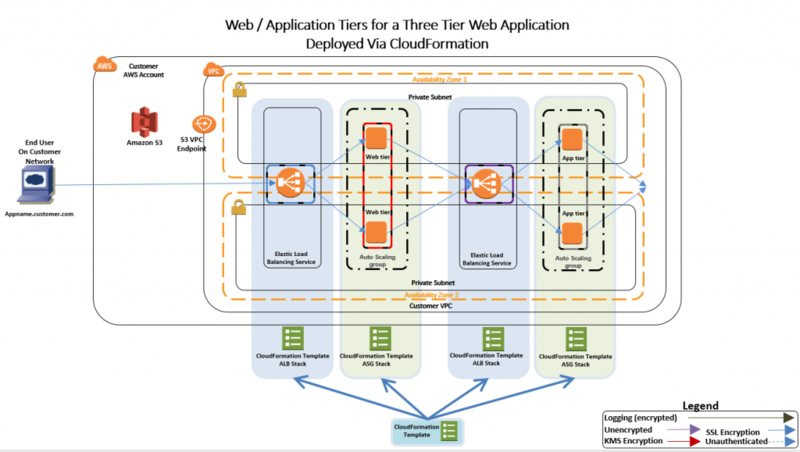 The following diagram illustrates web and application tiers deployed using native AWS CloudFormation. The AWS CloudFormation template describes the AWS resources in the colored box above it. The CCOE does not need to write infrastructure as code for development teams. Developers write infrastructure as code for their applications; this gives them the flexibility to create architectures that meet their needs. This model is easier to scale than having a central team write all the infrastructure as code. Developers require permissions to directly access APIs for resources they are creating. It is difficult to implement preventative controls for resource configuration. Enterprises may view this as too much risk, especially when they are early in their cloud adoption journey. Developers need to understand the configuration options for each AWS resource. The CCOE needs to create detective and reactive controls to ensure that AWS services are used in a manner consistent with the company’s standards. 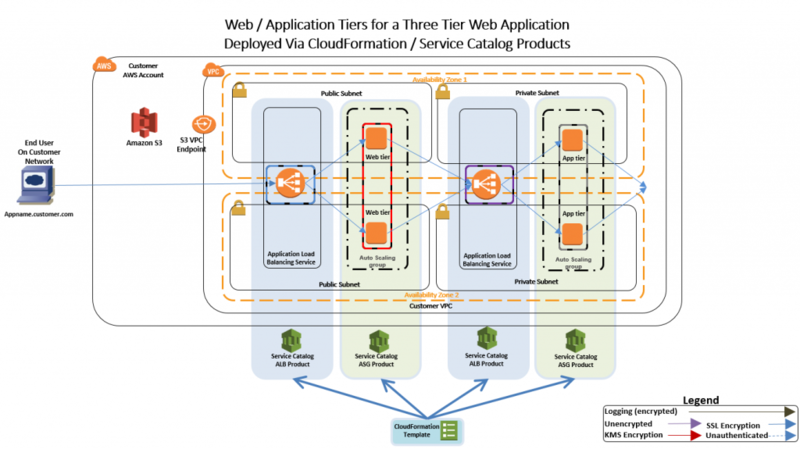 The following diagram illustrates web and application tiers deployed using a single AWS Service Catalog product. The CCOE is able to restrict access to AWS APIs, while still providing developers with the ability to provision AWS resources. It’s easy to ensure that AWS resources adhere to security / governance standards. Developers can launch AWS Service Catalog products from the console without writing any code. Developers do not need to understand the configuration options for each AWS resource. There’s less flexibility for developers. Developers can’t use AWS CloudFormation to describe their infrastructure. The CCOE needs to create a product per architecture. This may not meet developer requirements. The complexity and size of the AWS Service Catalog product is increased. Workload for the CCOE is increased. 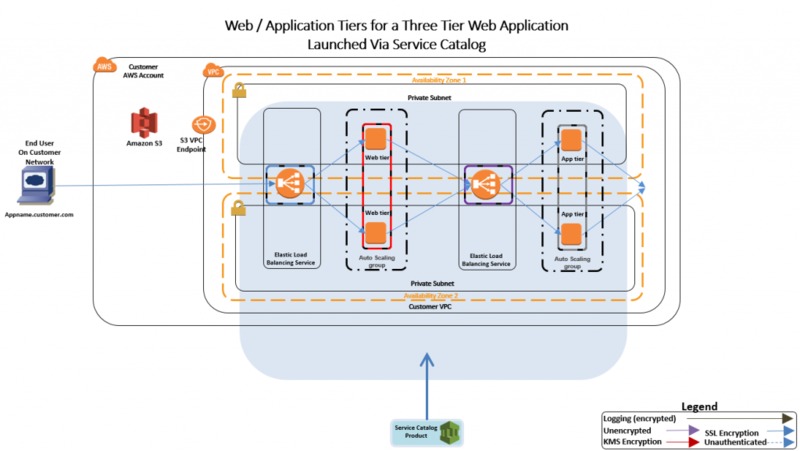 This diagram illustrates combining the previous two provisioning methods to deploy the web and application tiers using AWS CloudFormation support for AWS Service Catalog products. Restricts access to AWS APIs, while still providing developers with ability to provision AWS resources. Easy to ensure that AWS resources adhere to security / governance standards. The CCOE is responsible for creating simple components instead of complete architectures. Developers write their own infrastructure as code for their applications. Using parameters, they can customize the simple components to meet their needs. The CCOE needs to provide development teams with AWS Service Catalog resources IDs. Create a portfolio for your product. Create the Application Load Balancer (ALB) product. Create the Auto Scaling group product. Add both products to your “Dev” portfolio. Create launch constraints for the Application Load Balancer product. Create launch constraints for the Auto Scaling group product. Grant the appropriate user, group, or role permissions to the portfolio. In this section, I’ll provide the commands and the input parameters for each command. I’m using the cli-input-json parameter to improve the readability of the parameters for each command. If you did not know the format for the parameter files, you could use the generate-cli-skeleton parameter with each command to obtain it (example: aws servicecatalog create-portfolio –generate-cli-skeleton). Now let’s create a portfolio called Development Whitelisted Services. Make sure to capture the portfolio ID that is returned. When you create the product you will be required to specify the Amazon S3 location of the AWS CloudFormation template that describes the AWS resources the product will create when launched. Make sure to save the ProductId and the ProvisioningArtifactDetail ID from this step. These values are required inputs for the AWS CloudFormation template that launches these products. When you create the product, you will be required to specify the Amazon S3 location of the AWS CloudFormation template that describes the AWS resources the product will create when launched. Make sure to save the ProductId and the ProvisioningArtifactDetail ID from this step. These values will be required inputs for the AWS CloudFormation template that creates launches these products. I need to associate my products with my portfolio. Access to products is granted at the portfolio level. I’m using the portfolio ID from step 1 and the product IDs from steps 2 and 3. No text is returned if the command is successful. The launch constraint associates an AWS Identity and Access Management (IAM) role that contains the permissions necessary to launch the product. By leveraging this feature, developers will not require permissions to AWS APIs. I’m assuming the role has been previously created. "Description": "Grant SC permission to launch the ALB"
The launch constraint associates an IAM role that contains permissions necessary to launch the product. I’m assuming the role has been previously created. "Description": "Grant SC permission to launch the ASG"
Before users can launch the products I need to grant them permissions. If you didn’t capture the product ID or provisioning artifact ID when you created your product, you can use the following commands to find them. Notice for each command I am using the –query option to reduce the size of the response. The first command helps me find the product ID. This second command helps me find the provisioning artifact ID. I’ll need to use the product ID I obtained earlier (prod-6w72oh4zxhhhq) as an input for this command. The describe-product-as-admin command will return multiple artifacts, once for each product version. The query parameter can help reduce the output. The CCOE will need to provide the development teams the product ID, provisioning artifact ID, and the list of parameters for each product. Keep in mind that the provisioning artifact ID is going to change with each update of the product. These values will be unique to each AWS account/Region the development teams uses. You will want to implement a scalable process that avoids development teams having to ask the CCOE for these values. Many customers use an AWS Lambda-backed custom resource to discover resource values based on parameters passed into the custom resource. To keep my example simple, I’m going to pass these values in using AWS CloudFormation parameters. I’m going to use a single AWS CloudFormation template to launch my AWS Service Catalog products. I’m not explicitly including tags in this template. I would expect they would be passed during the create-stack API call or configured as part of the AWS Service Catalog product. As mentioned earlier, product ID and product artifact IDs are required inputs. I’m passing these in as parameters. In a real-world scenario there may be dependencies between the components we would want to consider. In this example I’m going to reference the target group Amazon Resource Name (ARN) created in the ALB template when I create my Auto Scaling group. If I was creating these resources using AWS CloudFormation nested stacks, I would use the !GetAtt intrinsic function to reference the outputs from one AWS CloudFormation stack and pass them into another. AWS Service Catalog products in AWS CloudFormation do not support AWS CloudFormation outputs. To work around this, I am going to use an AWS CloudFormation export to obtain my Target Group’s ARN. This will require changes to my AWS Service Catalog product templates and the template I use to launch my products. An alternative would be to use the CloudFormation support for AWS Systems Manager Parameter Store to create and reference the Target Group ARN. Snippet from the ALB product’s CloudFormation output section: I’m using the stack name in the export name to ensure that I have a unique name for my export. Snippet from Auto Scaling group product’s CloudFormation resource section: In this snippet I am importing the target group ARN from the ALB stack. The ALBStack name has been passed in as a parameter and is used to construct the name of the export. Snippet from resource section of the CloudFormation template that deploys the solution: I can use the !GetAtt intrinsic function to obtain the CloudFormationStackArn property of an AWS Service Catalog product. I need to parse this value before I pass it into the Auto Scaling group parameters. I’m using the Split and Select functions twice to accomplish this. The end result is that I only pass the AWS CloudFormation stack name into the ASG template. The following is the complete AWS CloudFormation template I am using to create my infrastructure from the AWS Service Catalog simple component products. Thanks for taking the time to read this blog post. I’ve shown you how AWS CloudFormation support for AWS Service Catalog provides you with the capability to preventatively implement security and governance controls in your AWS Service Catalog products, while granting developers the flexibility to create architectures that meet their applications’ requirements. Jim Long is a Sr. Cloud / IT Transformation Architect in the AWS Professional Services Financial Services Practice based out of Boston Massachusetts. He works with large enterprise customers to accelerate their Cloud adoption journey.